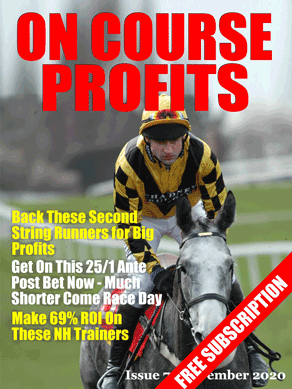 Today we are able to share a bit of the expertise available to Betting Insiders club members. The analysis and selections come from David Massey and Rory Delargey. Two guys that you will no doubt of heard of if you listen to any of the bookmaker/timeform radio channels. Below you will find their selections for today's racing along with their reasoning and analysis for each bet. This information is posted in the Betting Insiders Club members only forum where Rory and David are currently providing daily analysis and selections to all Betting Insiders members. Silver Roque looks a very fair price for what, at first glance, looks quite an open handicap at Perth but a few of these have been disappointing this year and one or two are probably running at the wrong trip too. The key to Silver Roque is simple – he goes particularly well after a break, with his last three wins all coming after breaks of 4 months or more. His last win, over Tahiti Pearl, may only have been at Sedgefield but he was hugely impressive, having the race won a long way out, and travelling strongly throughout. Add in the recent rain that has fallen at the track and the fact his trainer is back amongst the winners and the morning price looks a decent one. Apache Glory is more speculative but there are good reasons for thinking he’s overpriced. Genius Boy will go off favourite here, and whilst it would be wrong to say he’s a false favourite as he was punted off the boards for his debut at Wolverhampton and raced throughout like he knew his job, and clearly there will be more to come, but the form as it stands is ordinary and Beverley is very much a specialist track. But his presence will mean others go off overpriced (Maybeme was also looked at as a possible e/w selection too, he could go off a 33s chance if the favourite gets punted in again) but at the morning prices Apache Glory is the one that makes the most appeal. Winner of this race last year, this has clearly been the target again, and although he is 4lb higher than his victory last year he has also run well here in a better race from 4lb higher than this mark, so he’s handicapped to win again. Today is one of those days when I don't have anything in particular to tell you, so I figured it's a good day to update you on the Daily Punt Lays bot/portfolio. I'm now at the stage where I have software that will automatically place the lays for me, but also I have software that will extract selections from my daily Horse Race Base systems email and will upload them to the server for all bot users to download. What that means is that it doesn't really matter how many selections I have each day because it is no extra work whether I have 2 selections or 200! So my plan is to scale up and add more lay systems to the portfolio. As long as all the systems make a profit then adding more volume will increase overall profits. So far we have the Lay Debutants and the Lay Handicap selections and I've just added the Irish bumpers that I mentioned earlier in the week. This morning I've been researching horses in handicaps that have won their last handicap and placed in the race prior to that. Horse Race Base's Betfair price simulation suggests a lay profit of 88 points per year. So I'll be adding this system to the mix from tomorrow. By the way, if you run a tipping service and are interested in providing auto betting software for your selections, drop me a mail and I'll pass it on to the boss.